The Cosmic Infrared Background Experiment fired cameras above our atmosphere to collect just seven minutes of data, but these short experiments were enough to make us realize that the vast space between galaxies is not empty, but full of solitary stars. When the Hubble Space Telescope was pointed at the emptiest, darkest patch of sky we could find, and still imaged hundreds of galaxies, we were startled by the fullness of the universe. When the Spitzer Space Telescope surveyed the skies and found a pervasive infrared glow, we were surprised that space is warmer than we expected even between galaxies. But until the latest results from the Cosmic Infrared Background Experiment (CIBER), we hadn't realized that the glow may be produced by orphaned stars flung free of their galaxies, filling the not-so-empty vast space between galaxies. If so, this throws our entire definition of galaxies into question, expanding them from dense clusters to more amorphous regions encompassing these far-flung stars. 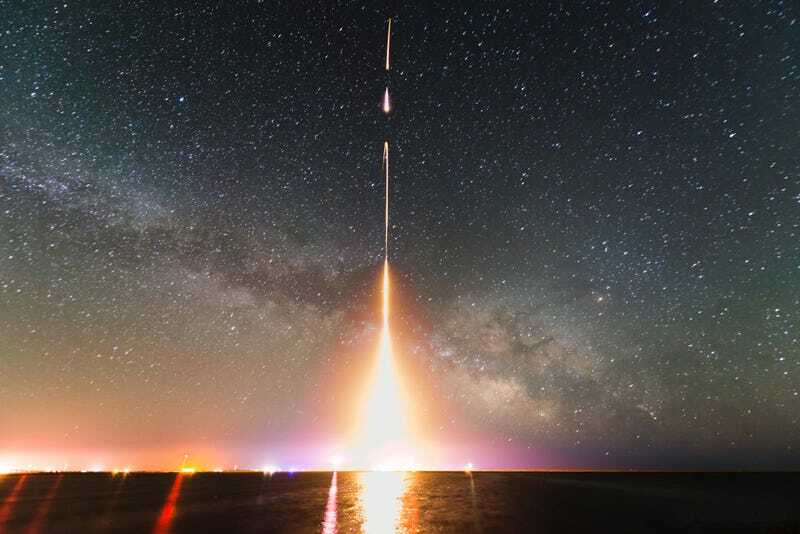 CIBER uses small suborbital sounding rockets, rockets so small they can't even carry a satellite into orbit, to pop above the atmosphere and snap wide-field infrared images of the galaxy. The cameras operate two infrared wavelengths shorter than Spitzer, the infrared space telescope, at 1.1 and 1.6 micron wavelengths, expanding the range of observations we have about this strange pervasive warm glow. These pictures are transmitted back to Earth, where scientists mask out bright stars, galaxies, and local light sources to get an unobstructed view of just the background glow. Four launches happened between 2010 and 2012, spaced so that the team could ensure their data was coming from outside our galaxy. Until CIBER, the competing explanations for the infrared glow between galaxies was either solitary stars flung free of their galaxies too distant to individually image, or a lingering relic from the very earliest galaxies. To distinguish between the theories, CIBER collected more infrared data at new wavelengths to better characterize the glow. A previously-undetected population of solitary stars would glow on the bluest end of the infrared spectrum, while ancient galaxies would be more red. "The light looks too bright and too blue to be coming from the first generation of galaxies. The simplest explanation, which best explains the measurements, is that many stars have been ripped from their galactic birthplace, and that the stripped stars emit on average about as much light as the galaxies themselves." The map of brightness fluctuations in the infrared background has splotches bigger than individual galaxies. Like observing the tips of icebergs to calculate subsurface ice volume, scientists can analyze the splotches of brightness to estimate the total amount of background light. Here's where things get even trippier: it looks like the infrared glow from these solitary stars is dramatically in excess of the glow produced by galaxies! Next up will be more experiments imaging the universe in yet more infrared wavelengths, trying to get a handle what is going on with these solitary stars. If they were stripped from parent galaxies by some cataclysmic occurrence, they should still be loitering nearby, forcing us to rethink how we draw boundaries on galaxies. And if they aren't, if these stars are truly lost and alone in space, then we're going to need to figure out how they formed, and how they got where they are today. Read about the CIBER results from the two White Sands, New Mexico launches in Science. Read more publications on the experiment here.